Razer has launched a new rewards program for folk who are willing to use their hardware to mine cryptocurrencies. In March 2017, HEXUS reported on the launch of the Razer zSilver and zGold virtual credits and rewards system, and now it has been updated so that you can earn rewards, not just by playing games, but through agreeing to do task your idle PC with some cryptomining. 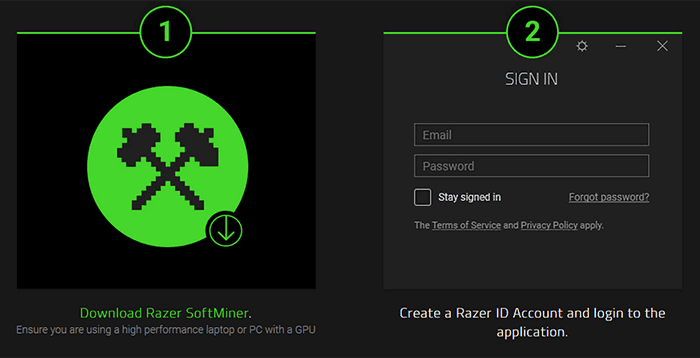 A new piece of software dubbed Razer SoftMiner must be installed for your to participate in this new program. 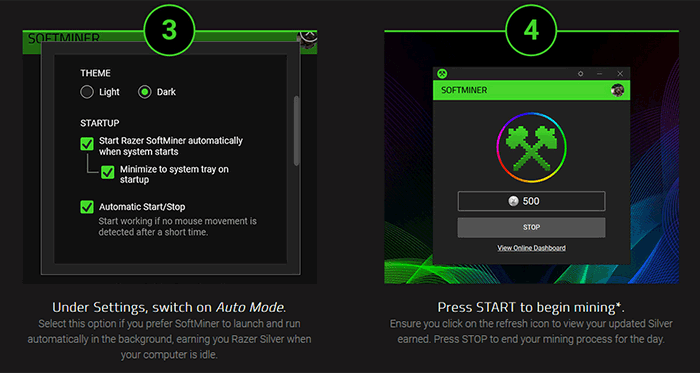 Razer says that with a suitable PC you will be able to earn up to 500 Razer Silver per day. For best results you will turn on auto-mode which leverages your unlimited internet connection. Razer suggests at least a GTX 1050 or RX 460 to get started with SoftMiner. However, keep in mind the mining speed and rewards will depend upon the processing power of your GPU and putting it under strain while you are AFK will cost you electricity and potentially shorten your PC's operating life. If you are interested in the range of products you can buy with the Razer Silver you earn, you can head over here to take a peek at the games and accessories that you can purchase using this virtual currency. 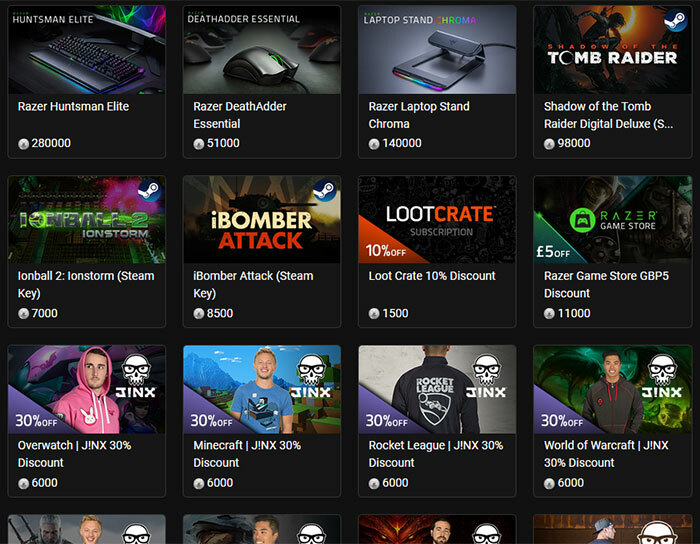 Below you can see a screenshot of the store where you can buy things with Razer Silver from USD5 store discount vouchers for S1,500, to games like Ionball 2 (Steam) for S7,000, though mice like the DeathAdder Essential for S51,000, to keyboards like the Huntsman Elite at S280,000. In response to Razer's Tweet about its launch of the new SoftMiner beta, one user shared his Silver earnings and affordability calculations. Scott Chicken asked Razer to respond to the following query: "Just to confirm running this at full power, every single day all day it takes 560 days to earn a Razer [Huntsman Elite] keyboard, valued at £199 as of their website. That being said that means you earn at most £0.35 per day mining at full power. So each Silver is worth £0.0007. Interesting." The Twitter user then spotted something in the T&Cs that makes such a plan even less appealing for end users - "Silver earned from mining has an expiry of 12 months"… Others calculated the associated energy prices, depending where you live, might cost you more than that target £199 item. Overall the SoftMiner sounds unappealing, hopefully Razer don't have any intention of bundling it with their hardware as an install option alongside its drivers and utilities. Can't see this taking off. So in addition to me spending money on electrickery to generate this Razer Silver, it takes me so long to earn that it expires before I've enough to spend on stuff… and what I give Razer may well end up earning them a fortune??!! Sounds more awesomely awesome than being a Corbyn Communist - Sign me up, eh! !